Coast Capital - "#1 Member"
This was another image that we had the pleasure to photograph as well as composite. 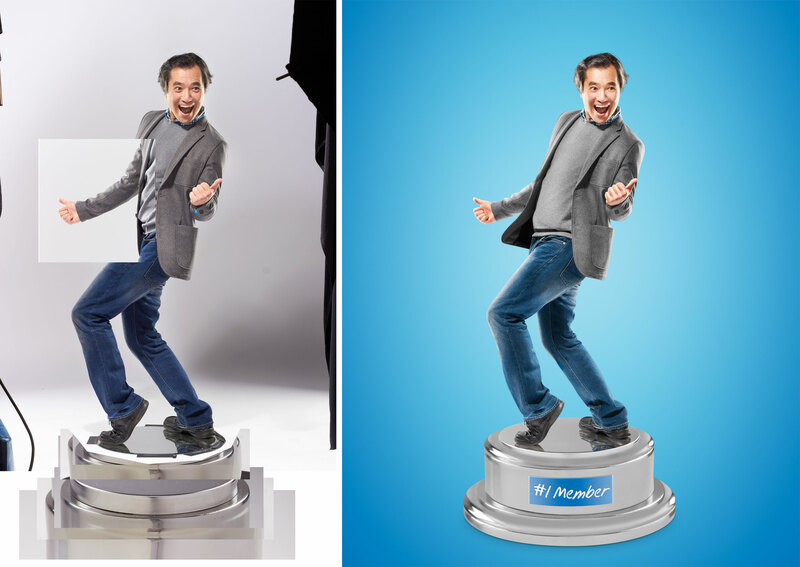 Our two main challenges were to create a chrome-plated trophy base, to make sure that the person stood at the correct perspective relative to that base, and to capture the correct reflection for the model’s feet. To solve the latter two problems, we had our model stand on a round mirror. This provided both the reflection we needed, as well as a perspective guide to match them to the trophy base. Locating a chrome trophy base in time for the shoot didn’t work out, so we created one. We painted a wood base with a metallic paint, but that wasn’t particularly convincing, so we shot it for a shape and perspective reference, and then created the trophy base by photographing a couple of chrome-finish bathroom implements from IKEA, one being a toilet brush holder, and the other a cup to hold toothbrushes. Those had the reflectiveness and highlight edges and so forth of chrome, so by aligning their edges and corners using the real trophy base as a guide, we created this one.